This is know as a twin needle or double needle. A twin needle is two needles joined on one flat shank. The double needles create two rows of parallel stitching lines and can be used in almost any home sewing machine with zigzag sewing capabilities. 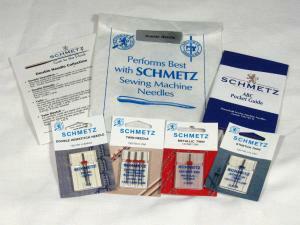 Be sure you machine has a zigzag foot and a needle plate with a horizontal hole to avoid needle breakage. Check your owner's manual for double needle threading instructions. Best source for almost everything sewing-related. Thanks so much.